High Wall Split Air Conditioning units have become the most popular type of air conditioner used in Australia today. There are many brands available from cheap inefficient low-tech systems with minimal after sales service through to high end technically advanced systems that are supported by a Quality National Service Network. Fully Airconditioned only sell and install highly efficient Daikin, LG and Fujitsu High Wall Split Air Conditioners and as Authorised Dealers for Daikin, LG and Fujitsu can provide quality after sales service on all the systems we supply. As the name suggests, a High Wall Split Air Conditioner consists of two components “split” to accommodate installation in a wide variety of situations. An unobtrusive and slim lined High Wall indoor unit provides the conditioned area with the heating and cooling function. It is connected via refrigerant grade tubing and electrical conductors to an Outdoor unit which provides the heating and cooling “power”. 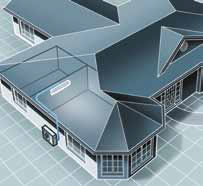 The split capability allows for the Indoor unit to be located where it is most needed. This also allows for the Outdoor unit to be mounted in a location where it has minimal impact on the aesthetic and environmental aspects of a building. Fully Airconditioned provides quality installations and can design a system to meet almost any customers’ requirements. We take pride in the quality of our workmanship and take the time to ensure all our customers are highly satisfied with our product. 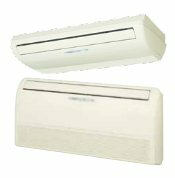 High Wall Split Air Conditioners are available in a wide range of capacities to suit the smallest of bedrooms through to large commercial building applications. Check out what we can supply and install in the Daikin, LG and Fujitsu range. Call us for an obligation free quote on a quality installation to suit your needs and budget. Variations of the split air conditioning system are available if a high wall system doesn’t suit your needs. Ceiling cassette, ceiling/floor units and floor standing units can provide cooling and heating where the installation of a wall system doesn’t suit. These units are positioned on the floor against a wall. To operate efficiently, they need clear space in front of them. So they should not be positioned behind lounge suites or couches that obstruct the airflow. Some units can also be semi-recessed into the wall to make them less obtrusive. These units fit neatly into the ceiling and are an ideal option to condition rooms where there are no available walls to mount a split system on or where there is limited ceiling space for a ducted system. These units can be positioned on the wall at floor level or attached to the ceiling. The major benefit of these units is that they are highly practical in homes where wall and floor space is limited.